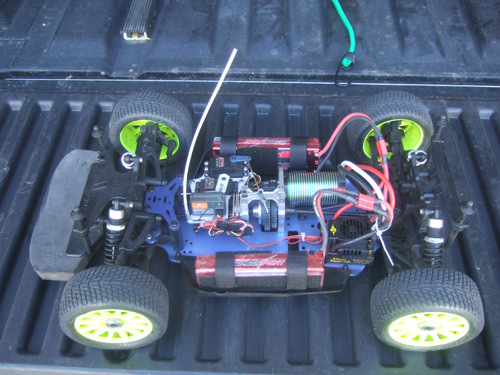 This is my first attempt to convert the Kyosho Inferno GT from a big block .28 nitro engine to a electric brushless system. Since everyone is going ‘green’ I thought I should too…..Just kidding! I and going electric because of the speed and power. 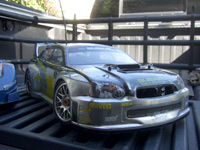 Unlike my previous brushless conversions I actually purchase most of the main components, instead of fabricating my own. Here is a view from the top of the newly converted Inferno GT. Take a look at the Brushless Conversion Center Diff Motor Mount Set that I bought from ebay. Most conversion kit only come with the CNC machined mount that the brushless motor is attached to. But the set I got from ebay come with the whole diff case that is CNC aluminum. Even the motor mount from RC_Monster only comes with one end of the center diff case, like the pictures below. That is why I went with the one from ebay instead. If you compare the picture from above (RC-Monster motor mount) and the picture below (ebay motor mount) they both look similar. 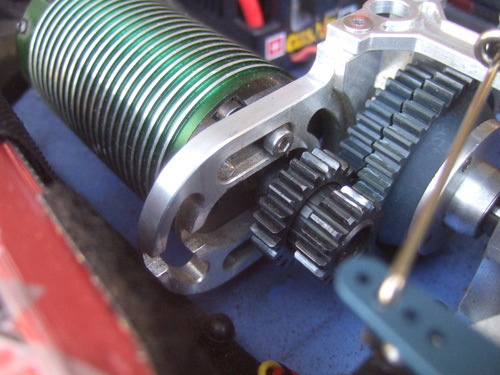 The picture below also gives a close up look at the RC-Monster 2 speed Pinion gears and adaptor. Unfortunately the gears were not perfect, meaning I had to do some sanding and re threading of the smaller pinion gear. When I got the gear the inner threads on the pinion gear was not threaded all the way to the end, so I was not able to screw the pinion gear on to the adapter. The only way I could screw it on is backwards. 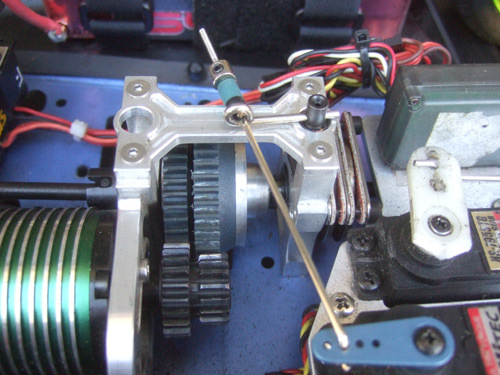 If you take a look at the smaller pinion you can see that there is a lip on one side of the gear, that mean there is only one way you can mount the gear. If you screw it on the other way the 2 gears with be right next each other and not have the gap you see now. So, I took a little file and tapered off the edge where the tread was not finished. Since I do not have a tap that is the right size, I had to use the pinion adapter as a make shift tap by screwing and unscrewing the pinion on the adapter until I was able to screw it all the way through. 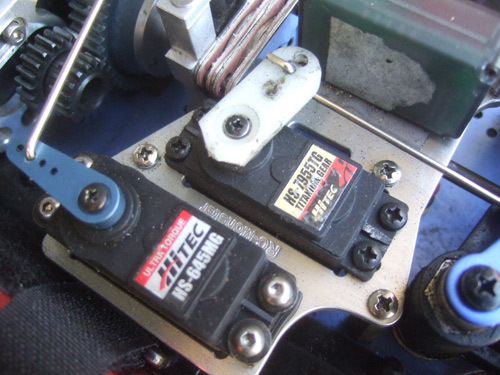 Here is a picture of the RC-Monster Servo mounts, it is nothing special. I was too lazy to fabricating something myself, and since I was going place an order with RC-Monster anyways I just bought what they had instead. At first I wanted to buy or fabricate a battery tray for the IGT. 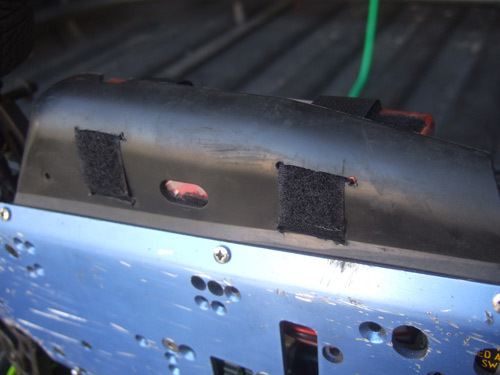 But during my test runs I double side tapped the batteries to side guards and they held on pretty well. So after sitting there staring at the IGT for a few minutes I thought I could just Velcro it to the side guards, its kind of like double sided tap but easier to mount and dismount. And this is what I came up with, and so far it works great! Click here to see some new Mods I did to make it look and handle better.